Grateful Med was an NLM-developed software program that was intended to expand and ease access to the NLM databases, including MEDLINE. 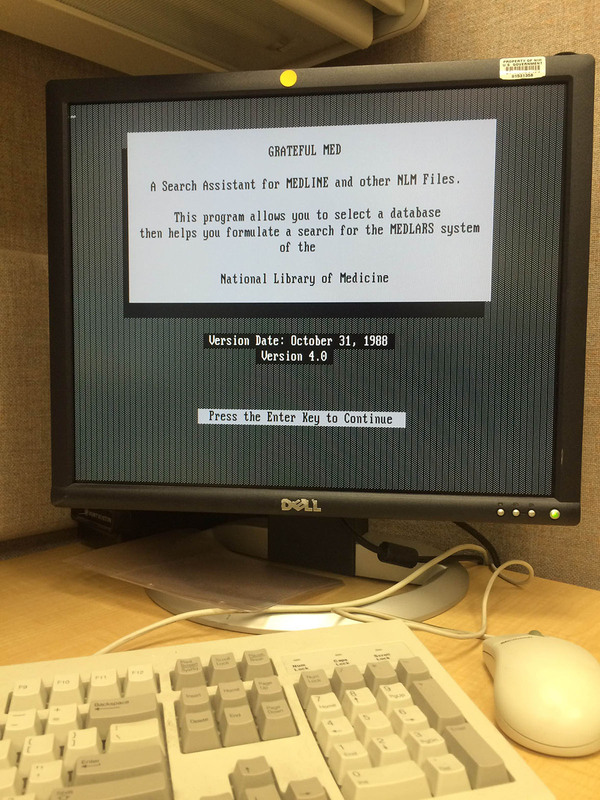 Supported and in use between 1986 and 2001, this piece of software is part of an important trend in the history of computing and the history of NLM itself. Before explaining the history of Grateful Med, I need to explain first what purposes Grateful Med served, how it interacted with the rest of the NLM infrastructure, and how it relates to the history of computer and software development. Grateful Med functioned as the user-friendly front-end to ELHILL. ELHILL was the retrieval system for MEDLINE searches, and although it has not been explicitly mentioned yet in this series of blog posts, it was an integral part of the NLM infrastructure. Originally developed in 1969, various iterations of the program played a part in AIM-TWX, MEDLINE, and eventually Grateful Med. However, ELHILL was not easy or intuitive to use, so in 1984, newly appointed NLM Director Donald A.B. Lindberg MD began a project to create a user-friendly system for people to search NLM databases. Based on the idea that NLM data should be searchable by non-trained, non-specialist researchers, Grateful Med opened up NLM databases to a wider community, although the searches themselves were still powered through ELHILL as they were before. Although Grateful Med was designed to be as user-friendly as possible, many users still required training, even if this training was not nearly as extensive as the training that medical librarians received to work with previous search systems. To provide Grateful Med training, NLM created computer tutorials and other resources that would walk a user through the variety of tools that the software provided. The tutorial for Grateful Med was called “HowTo Grateful Med,” and it demonstrated how computer networks worked, provided example searches, and explained how best to construct search queries using medical vocabularies and Boolean logic. NLM publications complimented these tutorials and provided advice and updates on using Grateful Med. One such publication, Gratefully Yours, ran from 1990 until 1998. Grateful Med was a successful and important advancement to provide access to NLM resources, but perhaps the first thing people notice about it today is its name. Federal institutions, after all, aren’t known for naming their products after bands, particularly bands like Grateful Dead. 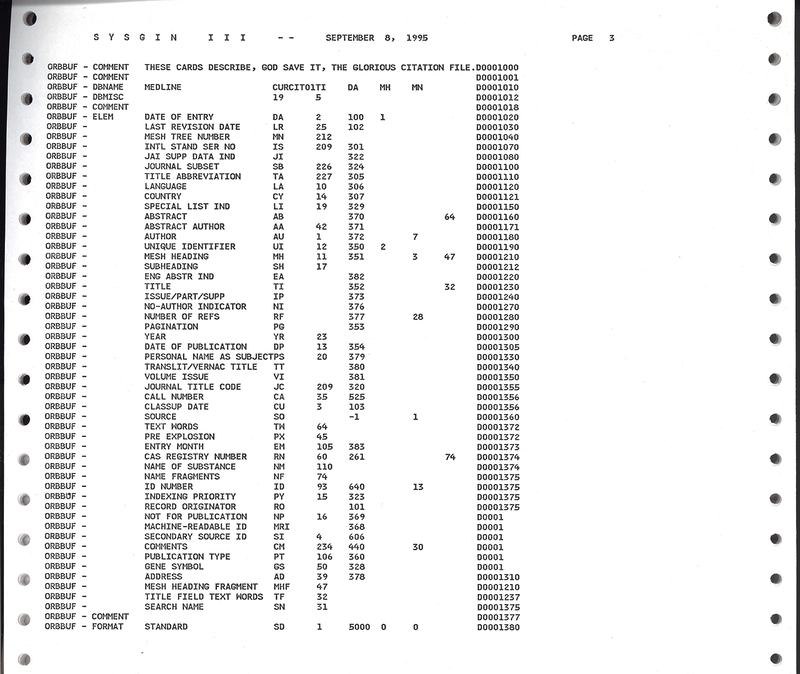 The majority of proposed names were more predictable, including “MICROMEDLARS,” “PCMEDLARS,” and “NLMSEARCH.” These names generally alluded to the fact that the program ran on personal computers, known at the time as microcomputers. Several suggested names stick out, including “TALKING HEADS,” “DISCOMED,” and “GRATEFUL MED.” TALKING HEADS also referred to a band, and DISCOMED referred to disco music. 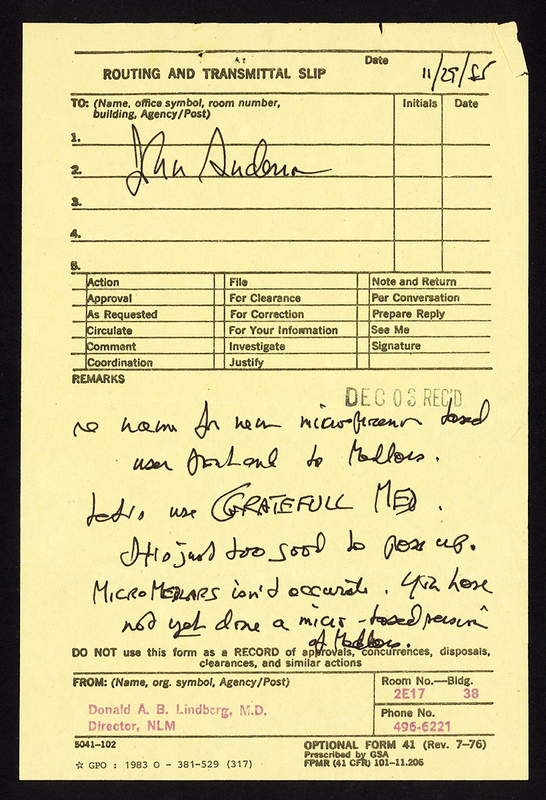 However, as visible in the image of a memo below, Director Lindberg chose Grateful Med because, “It is just too good to pass up.” And, thus Grateful Med was given a pleasantly unexpected name. Grateful Med’s initial and continued development interacted with a variety of other NLM projects like ELHILL, and its success depended on the success of many other aspects of the NLM infrastructure, both technological and administrative. In this way, Grateful Med didn’t revolutionize the services that NLM provided on its own; instead, it was part of a larger array of projects that aimed to expand access to NLM resources. Grateful Med, as the end-user interface, was simply a very visible part of these larger changes. Concerns about making computers and networks more user-friendly did not exist only at NLM. Research groups from the 1960s forward have investigated how humans interact with computers. 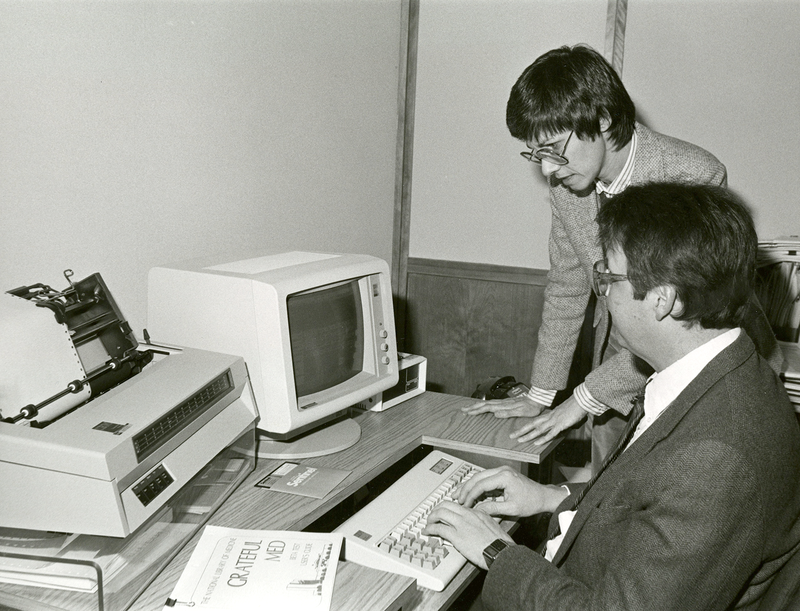 Some examples of the more notable early work include Douglas Englebart’s at the Augment Research Center at Stanford University, where the computer mouse was pioneered, as well as the research at XEROX PARC toward the “office of the future.” With the growth of personal computers in the 1980s, discussion on the relationship between humans and computers expanded, as exhibited by the coining of the term “human-computer interaction” in 1983 with the publication of The Psychology of Human-Computer Interaction. 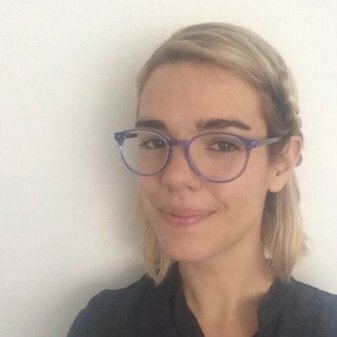 Research at corporations, government agencies, and academic institutions began to address issues in technology design with techniques and conceptual frameworks from ethnography and psychology. It is not a coincidence that this type of research grew as personal computers became more popular. Personal computing made it financially advantageous to have user-friendly technologies. Prior to the creation of personal computers, most computing was done in academic, corporate, or military settings where employers hired specialists to interact with the computer. After personal computers began to be more popular, corporations had a financial incentive to address usability concerns, and in this way, the possible uses for computers began to expand. Grateful Med, as a software program that was built for personal computers, was a part of this larger historical narrative. It was conceived, designed, and implemented with usability and the reality of personal computing in mind. Grateful Med was an immensely successful project and use of the software product increased quickly, both domestically and internationally. For example, the number of authorized users increased by over 50% in under a year in 1987. As use of Grateful Med increased, so did overall access to NLM resources. BY 1994, Grateful Med accounted for 80% of the over four million ELHILL searches of NLM databases. It was even featured on an episode of the television show Doogie Howser, MD in 1991. In 1996, NLM launched Internet Grateful Med to provide access through the internet rather than other computer networks, which helped further increase Grateful Med’s popularity. The internet dramatically altered the shape of NLM services and infrastructure. As PubMed and other internet-based resources were developed, NLM gradually transitioned away from earlier products. Grateful Med was officially retired in 2001. As a part of my time as the National Digital Stewardship Resident at the National Library of Medicine, I have been working to preserve a piece of NLM-developed software. We chose to preserve “HowTo Grateful Med” because of the importance of Grateful Med and the difficulties associated with preserving Grateful Med itself. Grateful Med is a piece of a larger infrastructure and requires that larger infrastructure to operate properly, but “HowTo Grateful Med” is self-contained and easier to re-create on modern computers. “HowTo Grateful Med” contains example searches on Grateful Med so it can give users an idea of what Grateful Med was like while avoiding the technical difficulties of preserving Grateful Med itself. The goal of the residency is to make the software program available through the NLM Digital Collections within the coming months. This blog post is third in a series on the history of computing and software development at the National Library of Medicine. On May 5, 2016, the 2015-2016 Washington, D.C. cohort of National Digital Stewardship Residents will present a symposium entitled “Digital Frenemies: Closing the Gap in Born-Digital and Made-Digital Curation” at the National Library of Medicine (NLM). The symposium will assemble speakers from cultural heritage and academic institutions to address the relationship between digitized and born-digital material. Next Post: 118 and Counting: Happy Birthday MLA! Interesting story.,I have found though that the sharing of medical information between your doctors does not appear to work.My medical provider is well known in the state.They do not even share information between the different offices I am sent to.Their hospital is less than 1/8th mile from the medical center I use.I was required to re-submit everything over again.I mdo not know why;but,I bring an information list with everytyhing they wish to have each time I visit a different location. My associates and I wrote and created the documentation for Grateful Med as the program evolved over the years. If you need any copies of the documentation packages for your archives, let me know and I’ll send them to you. Hi Chris! I’d love to talk you about this documentation. If you could send me an email at nicole.contaxis – at – nih.gov, I’ll get back to you to you as soon as possible. Interesting story about Grateful Med. I remember something about Grateful Med, but I couldn’t say what. Hi! We are working on having a audio recording of “Digital Frenemies,” and if we are able to do so, we will publicize it as much as possible. PubMed did replace Grateful Med. Glad to hear you enjoyed the post!